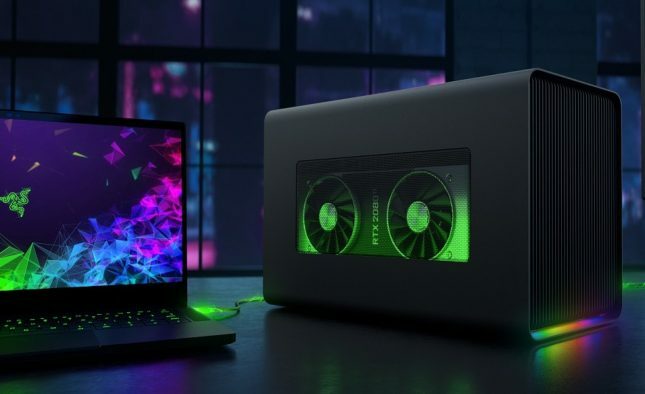 Razer has outed a new external GPU that aims to bring more powerful graphics processing to laptops. The eGPU is caleld the Razer Core X, and it includes a 700W power supply, USB, Gigabit Ethernet, and Razer Chroma lighting. The eGPU will work with a range of Thunderbolt 3 Windows laptops and MacBooks. Razer says that the device will support the most demanding games and give mobile users “world class” content creation capability. Windows notebooks need to be running the latest Windows RS5 update to get support for eGFX. Mac systems need a Thunderbolt 3 port, macOS 10.13.5 or later, and a compatible AMD Radeon video card. The aluminum enclosure also has Razer Chroma lighting for some bling. The Razer Core X enclosure along launches today for $399.99. You will need to bring your video card, supported cards include NVIDIA GeForce RTX, GeForce GTX, and Quadro cards to AMD XConnect enabled Radeon and Radeon Pro cards.